If you are mining Ethereum you have the Ethash folder where the DAG dataset is generated, and the folder will get bigger and bigger. The chance is big that you came here to find out how you can move your Ethash folder. I had the same problem, I stored the DAG files on my primary partition, and after mining I had less and less space so that I wanted to change the DAG folder destination. 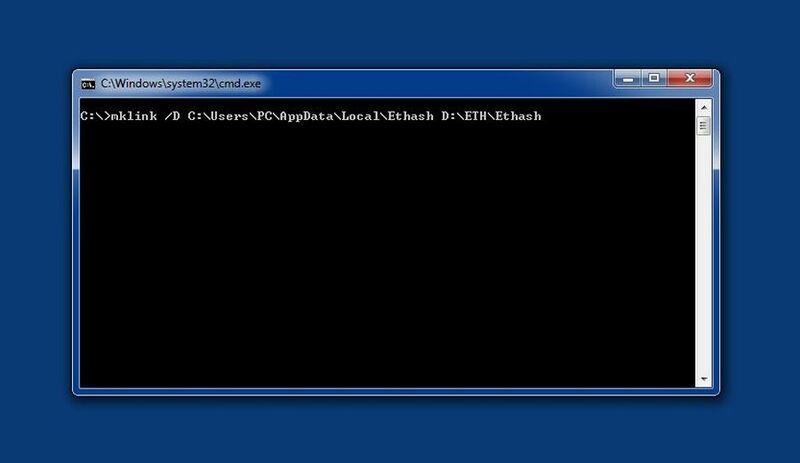 In this article you will learn how to do exactly that, you will learn how to move or change your Ethash (DAG) folder. The problem was that I had the DAG stored in “C:\Users\PC\AppData\LocalEthash” but I wanted it to be in “D:\ETH\Ethash”. To solve the issue, I created the new folders first. I created the folder structure “D:\ETH\Ethash”. I moved all the files from “C:\Users\PC\AppData\LocalEthash” to “D:\ETH\Ethash”. Now I clicked on start in Windows and typed “cmd” into the search to open the Windows command shell. Then I typed “mklink /D C:\Users\PC\AppData\Local\Ethash D:\ETH\Ethash” into the shell. This command creates a symbolic directory link, so that there is a reference where the files are now located. Note that my Windows user folder is called “PC”, that means you have to use your own folder name there if you want to use the “mklink” command. If this reference is set after you used the command, you are good to go. There is nothing more you need to do. To understand it, you just moved your files from one folder to another, and to make the mining tools understand it, you created the reference that the files are now located somewhere else. With this trick, you do not run out of space on your primary partition or SSD drive, and the DAG will be on a much bigger partition. You can now continue to mine Ether without worrying about space problems.